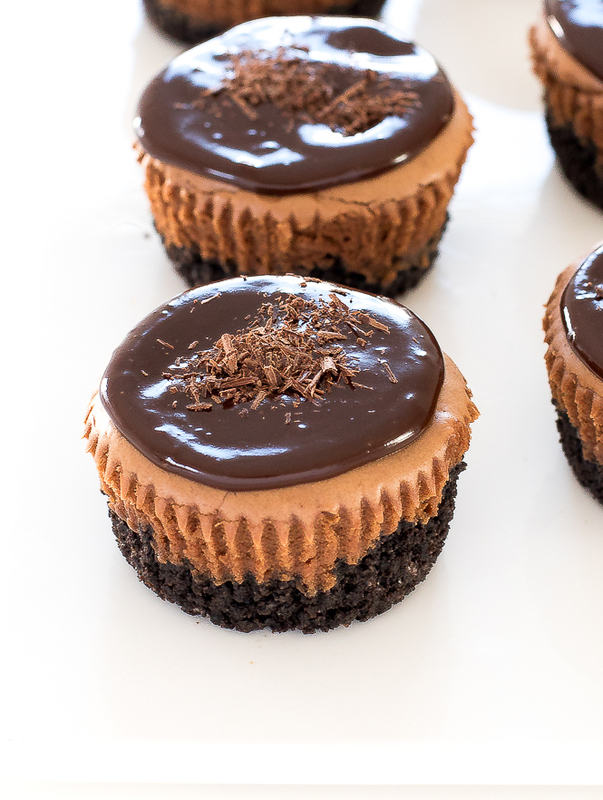 Triple Chocolate Mini Cheesecakes. Oreo Cookie crust layered with chocolate cheesecake and topped with a chocolate ganache. Perfect for chocolate lovers! I love making mini cheesecakes rather than a whole cheesecake. My Mini Cheesecake recipe is one of my top recipes on my blog! They are super easy to make and the perfect portion size. 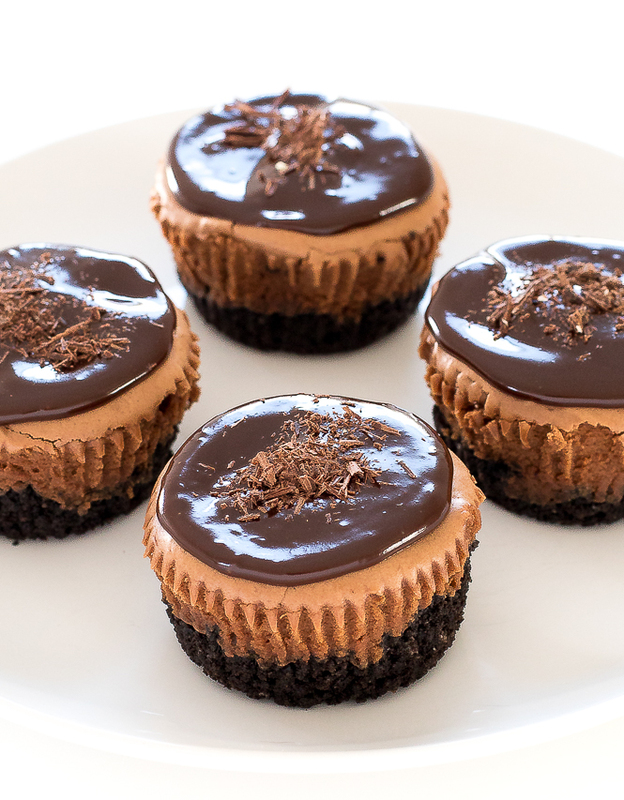 These Triple Chocolate Mini Cheesecake Cupcakes are made in a muffin pan with cupcake liners. Super easy to clean up and doesn’t require a special pan. 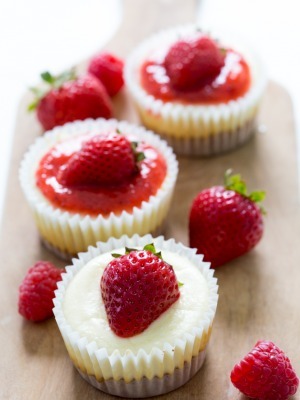 These mini cheesecakes are rich, creamy and smooth. I made the filling with cream cheese, sour cream, eggs, vanilla and melted bittersweet chocolate chips. Once the cheesecakes are baked and cooled I make the ganache. I combine semi sweet chocolate and heavy cream and microwave until melted. Next, I spread the ganache on top of each mini cheesecake and place back into the fridge to allow it to cool and set. Before serving I sprinkle them with chocolate shavings. Fresh fruit would also be great on top of the cheesecakes. This recipe makes 12 perfectly sized mini cheesecakes. They are perfect for serving a crowd and the recipe can easily be doubled. 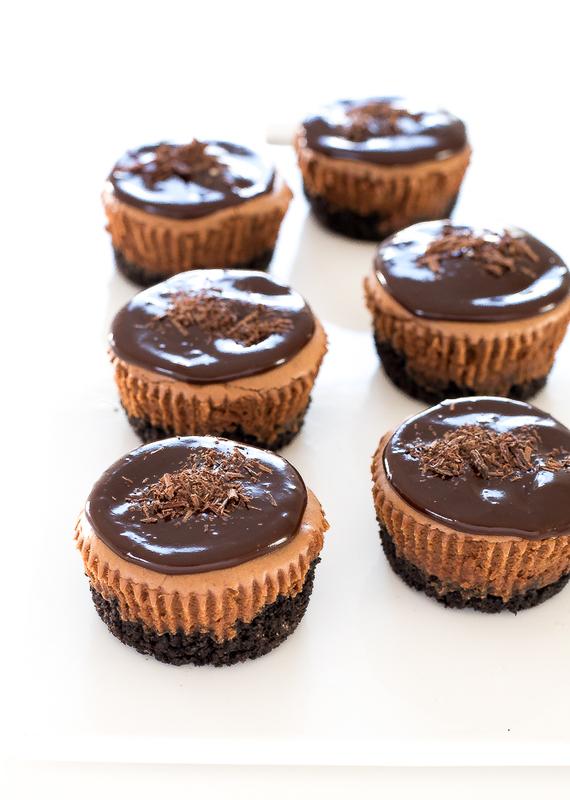 If you are a chocolate lover than these Triple Chocolate Mini Cheesecakes are made for you! 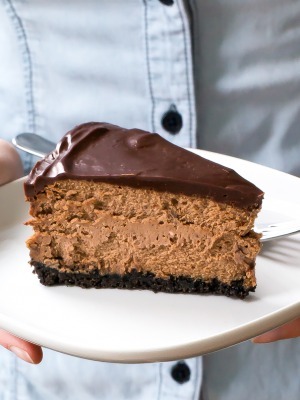 I also have an easy No Bake Cheesecake and a full sized Triple Chocolate Cheesecake that you would love! Line a regular size muffin pan with paper liners. (I recommend using the paper liners over foil) Set aside. Add Oreos to a food processor and pulse until they resemble fine crumbs. Add the crushed Oreos and butter to a small bowl and mix to combine. Evenly divide the mixture into the lined muffin tin. Add in the cooled melted chocolate and mix to combine. Pour cheesecake mixture into cooled muffin tin. It will be about 2 tablespoons of filling each. Fill almost all the way to the top. Place in the oven and bake for 20 minutes or until the cheesecakes are set. They will still jiggle a bit. Do not over cook them. If they start to crack they are getting over cooked. Pour 1 tablespoon or so of the ganache on top of each cheesecake and smooth the top. Place back in the refrigerator to set. Serve chilled with chocolate shavings on top, if desired. Allow the ganache to cool for about 2-3 minutes. Could you omit the Oreo crust? You Can. The only thing you might run into is they might not come out of the paper quite as easy. But who says desert can’t be a little messy? I hope you enjoy!